United States men's national soccer team head coach Gregg Berhalter. ORLANDO, Fla. — The U.S. men's national soccer team has been training this week a few exits down Interstate 4 from Disney World, which is fitting because its new coach, Gregg Berhalter, has ventured into a version of Tomorrowland. Cynics might call it Fantasyland. For a program still haunted by a failed World Cup qualifying campaign — one that cost two famous coaches their jobs, led to an interim guide for a year and caused the greatest embarrassment to the program since its founding a century ago — Berhalter is attempting to angle the team into the future. To prepare the players, he and his staff have been in constant communication for weeks, supplying video files highlighting themselves and the next opponent, reaching out via Skype and making personal visits to MLS and European markets. "They are probably sick of me by now," he said. 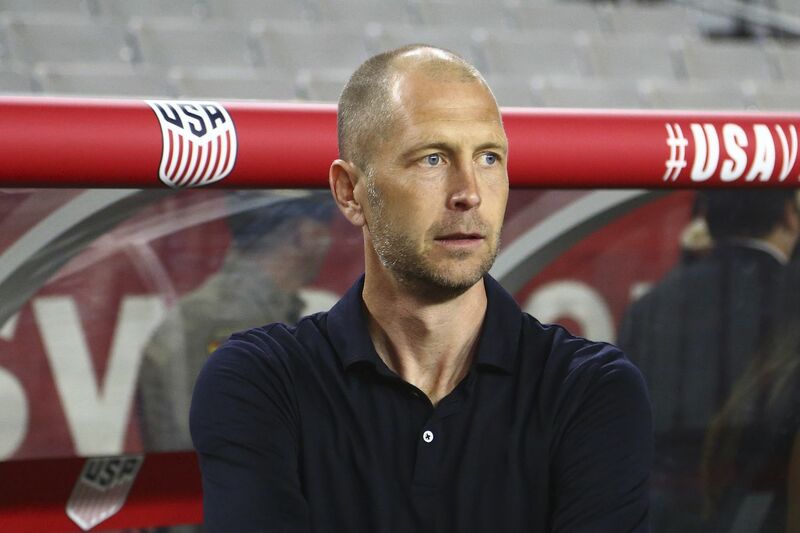 After a winter camp and two low-key matches featuring MLS-based players, Berhalter will have his first global cast available for Thursday's friendly against Ecuador at Orlando City Stadium and Tuesday's test against Chile in Houston. "It's cool to have a fresh face, a new coach, a new staff," said Christian Pulisic, the 20-year-old centerpiece of Berhalter's reconstruction. "We feel like we have a new beginning now, a fresh start and a good coach to help us with a good style. Everyone is just hungry right now." This is the first year of a new World Cup cycle, which will begin with regional competitions (Concacaf Gold Cup and Nations League) and accelerate into the qualifying phase for the 2022 tournament in Qatar. Berhalter, 45, was hired in December, plucked from MLS's Columbus Crew, where he made the most of limited resources and forged an identity through meticulous preparation, ball control and movement. A former World Cup defender who spent most of his club career abroad, he will attempt to mesh a small group of experienced players with a rising generation led by Pulisic, who this summer will join Premier League club Chelsea from German titan Borussia Dortmund, and two other Bundesliga-based 20-year-olds: Weston McKennie and Tyler Adams. The mission includes altering the perception of the men's program, which, since missing the World Cup for the first time since 1986, has been ridiculed at home and abroad. This year, the men will operate in the shadows of the top-ranked women's team, which in the summer in France will bid for a fourth world title. McKennie said, "That is one of the goals that we have as a national team: to change the way people look at American [men's] soccer." English-based defender Matt Miazga said: "It's the start of a new cycle — new staff, new regime, trying to build a new culture and new identity. We are all on board, we are all excited about the challenge and we know it's not going to be smooth sailing. It never is." To accelerate the process, Berhalter barnstormed Europe to meet individually with players in their club routines, establishing a steady line of transatlantic communication. "They are here for the first time together," he said this week, "but there is a familiarity in that we've already seen them and talked to them." No matter who is summoned for matches and tournaments in the coming years, he added: "The philosophy will remain consistent: What we're trying to do with the ball, how we want to disorganize the opponent using the ball to create goal-scoring opportunities. That is who we are." The formation is likely to feature Pulisic and McKennie in central attacking midfield roles behind a three-man front line. Pulisic described it as "a very certain style that is what this country needs, and it's really positive." Berhalter, Pulisic added, is "very focused on all details of the game. I have been amazed in the first few days how much information he has gotten across and how he wants every guy to have a perfect understanding of how we want to go into the game. He has taken pride in making sure every single guy understands the system." Beyond the tactical changes, players say Berhalter is implementing a fresh culture. "We have a structure," McKennie said. "We have a set idea and a game plan. We are all trying to get on the same page." The approach stands in contrast to Jurgen Klinsmann's tenure from 2011 through 2016, when players privately grumbled about the coaching staff's lack of preparation and ill-defined roles before training camps opened. There is also a new culture evolving, anchored by holdovers like Michael Bradley, John Brooks and DeAndre Yedlin but open to fresh voices, such as McKennie's. Asked who is speaking up, Brooks said: "Weston. Definitely Weston. Who else? I think it's only Weston. He's so loud. Everyone compared to him is like quiet." "I am next to him in the hotel; I can hear him. He is loud, all right. It's his personality. He will say what is on his mind." The bond between Pulisic, McKennie and Adams is strong — they rose together through the U.S. youth system and have landed starting roles on one of the sport's most prestigious circuits. Last Saturday, after McKennie and Adams faced one another in a Bundesliga match, Adams crashed at McKennie's place and they flew together to Orlando. On the long path to the World Cup, building chemistry and establishing communication is one part of the process. "When you think about all the miles you traveled to meet players and now to have them all here is a great feeling and we're looking forward to the games," Berhalter said. "We really see this as trying to set the stage for the Gold Cup [this summer]. This is the starting point."